More than 2,000 pages of contracts obtained by Liberation newspaper — between U.S. propaganda stations Radio and TV Martí and Miami journalists posing as independent press — reveal a close partnership between the U.S. government and extreme rightwing Cuban-exile reporters in Miami. The Cuban Five are Cuban nationals who were on a mission in Miami to stop U.S.-based terrorism aimed at Cuba. They were arrested by the FBI in 1998 and imprisoned for trying to expose a new wave of violent acts against Cuba emanating from Miami. In seeking a trial outside that city, the Five cited the pervasive anti-Cuba prejudice in Miami. But the judge refused their numerous requests. 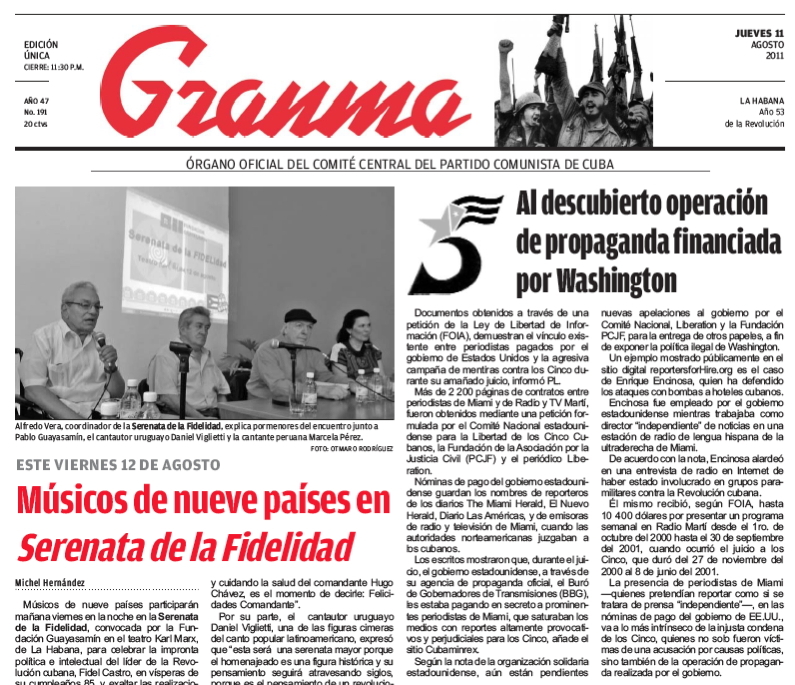 With the discovery — after the trial — of the U.S.-paid Miami journalists, the National Committee to Free the Cuban Five, Liberation newspaper, and the legal civil-rights organization Partnership for Civil Justice Fund began an investigation into how the anti-Cuba climate in Miami is financed and fostered by the U.S. government, even though it is barred by law from engaging in domestic propaganda. The organizations have documented extensive media coverage by the government-paid reporters. Some of the Miami journalists on the government payroll have a history of supporting armed attacks against Cuba. Others gave highly favorable coverage to Miami terrorist organizations that advocate violent overthrow of the Cuban government. Miami has the unique distinction within the United States of harboring terrorist organizations and individuals with the full knowledge, and often support, of Washington. These groups have carried out numerous violent attacks against the Cuban people with complete impunity. More than 3,400 Cubans have been murdered by terrorist attacks. Washington, through several government agencies, has a long history of arming and training anti-Cuba terrorists in Miami. It also, as it turns out, has a developed pattern of putting on the payroll of Radio and TV Martí individuals who have advocated and supported violent actions against Cuba.. The stations’ headquarters are in Miami, under the influence and direction of the Cuban extreme right living in Miami. Enrique Encinosa, who advocates the bombing of Cuban hotels, was employed by the U.S. government while he was working as an “independent” news director on the powerful right-wing Spanish-language radio station in Miami. During the Cuban Five prosecution, Encinosa broadcast news regularly on Miami’s 50,000-watt WAQI Radio (“Radio Mambí”), and was a frequent commentator on their arrest and prosecution. He received $5,200 to host a weekly Radio Martí show from Oct.1, 2000, to Sept. 30, 2001, for a total of $10,400. The Cuban Five's trial was within that time span, running from Nov. 27, 2000, to June 8, 2001. Encinosa boasted in an Internet radio interview: “I arrived in the United States in 1961. I became involved in the anti-Castro paramilitary organizations when I was 16. I participated in a number of military and covert operations into Cuba as a very young man. I worked cloak and dagger in covert operations …” The interview was in 2010. While the Five were monitoring the Miami terrorists’ plots in the late 1990s, Encinosa was co-hosting a clandestine shortwave radio station in Miami called “La Voz de la Resistencia.” It was beamed into Cuba on a weekly basis, and Encinosa would call for listeners to wage violent attacks on economic targets, as well as advocating assassinations of Cuban individuals. The Five were engaged in an anti-terrorist mission and never possessed a weapon in Miami. But they were often falsely portrayed as supporting terrorism by the Miami journalists. Julio Estorino’s history includes membership in Junta Patriótica Cubana, which was formed in the early 1980s. It advocated the violent overthrow of the Cuban government. Estorino’s resumé — from the BBG documents obtained by Liberation newspaper — shows his U.S. government employment by the BBG goes back to at least March 1998, several months before the Cuban Five’s arrest. His resumé states clearly: “Employer: U.S. Government, Office of Cuba Broadcasting … Miami Florida.” It is not possible yet to know the total amount that Estorino received from the BBG because the agency has not yet produced documents from before November 1999. But the material obtained by Liberation newspaper shows he was paid $14,950 from Oct. 16, 2002 to Jan. 31, 2004. 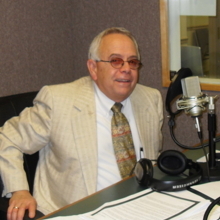 During the same period that Estorino was employed by the U.S. government he was also 1) Executive director of the morning news show of a right-wing Miami radio station WACC; 2) Host of that station’s daily evening drive-time interview show, “El Portal,” and 3) Co-host of “Al Día,” a daily news and opinion show. 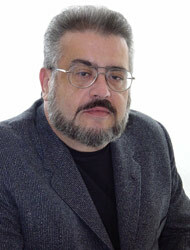 Since 1997, he has been a regular columnist for the Miami newspaper Diario las Américas. Within days of the Cuban Five’s arrest, Estorino wrote several articles for Diario las Américas on their case. When the Cuban Five were arrested on Sept. 12, 1998, a clamor began immediately by several of the most prominent U.S.-paid journalists for the Five to be indicted for the deaths of four pilots of Brothers to the Rescue (BTTR), who were shot down by Cuba when they invaded Cuban airspace. Cuba had warned the Clinton administration that further BTTR invasions into Cuban territory would no longer be tolerated. From the time of the Feb. 24, 1996, shoot-down until the indictment of one of the Cuban Five, Gerardo Hernández, on May 8, 1999, on false charges of “conspiracy to commit murder,” the Miami coverage was virulent, beyond any semblance of objective reporting. Some of the reporting also cast a guilty net over all the Cuban Five. The United States government has formally indicted a number of agents from Castro's dictatorship who were operating in South Florida, with conspiracy to commit murder, in relation to the downing of the Brothers to the Rescue airplanes and their tragic toll of four deaths on February 24, 1996. The Cuban exiles have waited forty years for the beginning of a recognition, even an implicit one, that their denunciations about the vile and wicked nature of Fidel Castro and the system of government he has imposed on our people, have not been exaggerations, mistakes, or lies. This vileness and wickedness has already reached U.S. territory and its citizens and it's time for the consequent actions to be taken: that Fidel Castro be indicted as well, along with everyone who participated in this infamous crime. It's time for justice to be done. Alberto Müller left Cuba for the United States in 1960 and formed a group called Revolutionary Students Directorate (DRE), which carried out terrorist attacks inside Cuba, including bombings in Havana. With training by the CIA, he infiltrated Cuba in 1961 to try to organize paramilitary actions in the Escambray mountains, just before the Bay of Pigs invasion. Müller was caught and convicted of terrorist attacks. After serving 20 years in prison and being exiled to the United States, Müller became a Miami reporter. The BBG contracts obtained by Liberation newspaper show government payments to Müller of $38,571 from Oct. 1, 2004, to March 31, 2010. Earlier, during the Five’s trial, he wrote incendiary articles about the Cuban Five and the BTTR plane shoot-down. The BBG has so far failed to release information relating to its employment of Miami reporters before Nov. 1999. The last minutes in the life of four pilots downed in international waters by Castro's MiG planes were filmed and recorded for posterity. What we needed to hear ... live ... shamelessly uninhibited, accented with bloody premeditated calculation ... the subordinates asking the commander in chief for the go-ahead to pulverize the defenseless airplanes of Brothers to the Rescue with a Soviet missile ... Five years have passed since the horrendous crime committed over international waters. That's why the matter should be put to the legal and humanitarian powers of every organization of human justice, from the International Criminal Court at the Hague to the Human Rights Commission at the United Nations. The Criminal Confession ... in the very voice of the underling executioner ... we have finally heard it with absolute clarity ... during the trial of Castro's spies who infiltrated Miami. What more is needed now to make the decision to try Fidel Castro? What more is needed now to make the decision to seat Fidel Castro in the dock at an international legal trial? Well, nothing. All the elements of the inquiry are at hand. The act is so despicable by its nature as a crime against humanity that it suggests the accused should be in the dock, whether they are subordinate executioners or executioners among the maximum leadership. The ReportersForHire.org website is making the newly disclosed FOIA documents available to the public. Because of the strong interest in the thousands of pages of contract material for the Miami media that Liberation Newspaper obtained and is the basis for this analysis and series of reports, we are making the underlying documents available for public review and comment at www.ReportersforHire.org. We have scanned the materials and made them text searchable with optical character recognition. These materials contain information on the BBG’s contracts with the Miami media, including, for example, the revelation that Enrique Patterson, a prominent Miami journalist, received $135,350 from the U.S. government between November 2002 and June 2007. We are inviting you to comment on sections or facts that you find noteworthy and we may use what you observe or uncover in the documents as part of these reports, or as an annotation to the documents. Please include page numbers of the documents and direct excerpts in your comments. Más de 2,200 páginas de contratos obtenidas por el periódico Liberation — concertados entre las estaciones de propaganda de EE.UU., Radio y TV Martí, y periodistas de Miami que se hacían pasar por prensa independiente — ponen al descubierto la estrecha asociación existente entre el gobierno de EE.UU. y los reporteros del ala de extrema derecha del exilio cubano en Miami. Los Cinco Cubanos son hombres de nacionalidad cubana, quienes estaban en una misión en Miami, que tenía el fin de detener el terrorismo con base en EE.UU., dirigido contra Cuba. Estos hombres fueron arrestados en 1998 por el FBI, y puestos en prisión, por tratar de revelar una nueva ola de acciones de violencia contra Cuba, procedente de Miami. Al buscar de obtener una sede para el juicio fuera de esta ciudad, los Cinco hicieron referencia a la predisposición contra Cuba dominante en Miami, pero la jueza rechazó sus numerosas solicitudes. Con el descubrimiento — después del juicio — de los periodistas de Miami pagados por EE.UU., el Comité Nacional por la Libertad de los Cinco Cubanos, el periódico Liberation, y la organización de derechos civiles legales, el Fondo de la Sociedad para la Justicia Civil, iniciaron una investigación acerca de la forma en que el clima contra Cuba existente en Miami, es financiado y apoyado por el gobierno de EE.UU., aunque le está prohibido legalmente difundir propaganda dentro del país. Las organizaciones antes mencionadas han documentado la extensa cobertura hecha en los medios por reporteros pagados por el gobierno. Algunos de los periodistas de Miami que se encuentran en la nómina de pago del gobierno, tienen historia de apoyo a los ataques con armas contra Cuba. Otros les dieron una cobertura altamente favorable a las organizaciones terroristas de Miami que abogan por la violencia para derrocar al gobierno cubano. Miami posee la exclusiva distinción en los Estados Unidos de albergar a organizaciones y ciudadanos particulares que son terroristas, con todo el conocimiento y muchas veces, el apoyo de Washington. Estos grupos han llevado a cabo numerosos ataques violentos contra el pueblo cubano con total impunidad. Más de 3,400 cubanos han sido asesinados por ataques terroristas. Washington, a través de varias agencias gubernamentales, tiene un largo historial de armar y entrenar a terroristas contra Cuba en Miami. También, como se ha revelado, posee un patrón desarrollado de incluir en las nóminas de pago de Radio y TV Martí, a individuos que han propugnado y apoyado acciones violentas contra Cuba. Los cuarteles generales de estas estaciones se encuentran en Miami, bajo la influencia y dirección de la extrema derecha cubana residente en Miami. Enrique Encinosa, quien ha defendido los ataques con bombas de los hoteles cubanos, fue empleado por el gobierno de EE.UU., mientras estaba trabajando como director “independiente” de noticias, en la poderosa estación de radio en lengua española del ala derecha en Miami. Durante el proceso de acusación de los Cinco Cubanos, Encinosa difundió regularmente noticias en la WAQI Radio de 50,000-watt de Miami (“Radio Mambí”), y fue un comentarista frecuente acerca de su arresto y acusación. Él recibió $5,200 por presentar un programa semanal en Radio Martí, desde el 1ro de octubre de 2000, hasta el 30 de septiembre de 2001, para un total de $10,400. El juicio de los cubanos abarcó ese periodo, pues se celebró del 27 de noviembre de 2000, al 8 de junio de 2001. Encinosa alardeó en una entrevista de radio en Internet: “Yo arribé a los Estados Unidos en 1961. Llegué a estar involucrado en organizaciones paramilitares en contra de Castro cuando tenía 16 años. Participé en varias operaciones militares y secretas en Cuba siendo un hombre muy joven. También trabajé de capa y espada en operaciones encubiertas …” La entrevista fue en 2010. Mientras los Cinco estaban monitoreando los planes de los terroristas de Miami a fines de la década de los 90, Encinosa era co-presentador en una estación de radio clandestina de onda corta en Miami llamada “La Voz de la Resistencia.” Esta estación estuvo trasmitiendo hacia Cuba semanalmente, y Encinosa convocaría a los oyentes a realizar ataques violentos contra objetivos económicos, así como también a abogar por los asesinatos de personalidades cubanas. Los Cinco estaban comprometidos en una misión anti-terrorista, y nunca poseyeron un arma en Miami. Pero fueron a menudo descritos falsamente como secundadores del terrorismo por los periodistas de Miami. En una entrevista varios días después del arresto de los Cinco Cubanos, publicada el 21 de septiembre de 1998 en El Nuevo Herald, Encinosa, quien fue citado como un experto en inteligencia, declaró que los arrestos tuvieron lugar porque la inteligencia de EE.UU. “haya detectado o tenga indicios de que esta información [supuestamente recopilada por los Cinco] está transitando por organizaciones terroristas fuera de Estados Unidos”. La historia de Julio Estorino incluye la membresía en la Junta Patriótica Cubana, la cual fue constituida a principios de los años 80 del pasado siglo. Esta propugnaba la violencia contra el gobierno cubano. El curriculum de Estorino — de los documentos de la BBG obtenidos por el periódico Liberación — muestra que es empleado por el gobierno de EE.UU. al menos desde fecha tan lejana como marzo de 1998, varios meses antes del arresto de los Cinco Cubanos. Su curriculum establece claramente: “Empleador: Gobierno de EE.UU., Oficina de Trasmisiones a Cuba … Miami Florida.” Aún no es posible conocer el monto total que Estorino recibió de la BBG, porque la agencia no ha presentado todavía documentos anteriores a noviembre de 1999. Pero el material obtenido por el periódico Liberation, muestra que le fueron pagados $14,950 desde el16 de octubre de 2002 al 31 de enero de 2004. Durante el mismo periodo que Estorino estaba empleado por el gobierno de EE.UU., era también 1) Director Ejecutivo de un programa matutino de noticias de la estación de radio WACC del ala de la derecha de Miami; 2) Presentador de un programa vespertino diario de entrevistas, “El Portal”, de la misma estación; y 3) Co-presentador de “Al Día,” un programa diario de noticias y de opinión. Desde 1997, ha sido columnista regular del periódico de Miami, Diario Las Américas. En los días del arresto de los Cinco Cubanos, Estorino escribió varios artículos para el Diario Las Américas acerca de su caso. A lo largo de su prolongado reino de terror [Fidel Castro], muchos han sabido y casi todos hemos supuesto que, efectivamente, aquí, en este país, en Miami, entre nosotros, se mueven y actúan agentes del castrato con diversas misiones, ninguna de ellas muy buena que digamos. Cuando los Cinco Cubanos fueron arrestados el 12 de septiembre de 1998, se inició inmediatamente un clamor por parte de varios de los más prominentes periodistas pagados por EE.UU. para que a los Cinco les fueran formulados cargos por la muerte de cuatro pilotos de Hermanos al Rescate (BTTR), que fueron derribados por Cuba, cuando invadieron el espacio aéreo cubano. Cuba había advertido a la administración de Clinton que no serían toleradas por más tiempo próximas invasiones de BTTR al territorio cubano. Desde la fecha del derribo de los aviones, el 24 de febrero de 1996, hasta la formulación de cargos a uno de los Cinco Cubanos, Gerardo Hernández, el 8 de mayo de 1999, sobre falsas acusaciones de “conspiración para cometer asesinato,” la cobertura en Miami fue violenta, más allá de tener alguna apariencia de un reporte objetivo. Algunos de los reportajes también lanzaban una red de culpabilidad sobre los Cinco Cubanos en conjunto. El gobierno de los Estados Unidos ha acusado formalmente a varios agentes de la dictadura castrista que actuaban en el sur de la Florida, de conspiración para asesinar, con motivo del derribo de los aviones de Hermanos al Rescate y su trágico saldo de cuatro muertos, el 24 de febrero de 1996. Cuarenta años hemos esperado los exiliados cubanos para que se empiece e reconocer, tácitamente siquiera, que no han sido exageradas, ni tergiversadas, ni mentirosas nuestra denuncias sobre la vileza y la maldad de Fidel Castro y del sistema de gobierno por él impuesto a nuestro pueblo. Esa vileza y esa maldad tocan ya la geografía de los Estados Unidos y a ciudadanos de este país y es hora de que se actúe en consecuencia: que sea encausado Fidel Castro también y junto con él, todos los que tuvieron participación en este crimen infame. Alberto Müller salió de Cuba para los Estados Unidos en 1960, y formó un grupo llamado Directorio Revolucionario Estudiantil (DRE), que llevó a cabo ataques terroristas dentro de Cuba, incluyendo la explosión de bombas en La Habana. Con entrenamiento de la CIA, se infiltró en Cuba en 1961 para tratar de organizar acciones paramilitares en las montañas del Escambray, justo antes de la invasión de Bahía de Cochinos. Müller fue capturado y condenado por ataques terroristas. Después de 20 años en prisión y de estar exiliado en los Estados Unidos, Müller se convirtió en reportero en Miami. Los contratos de la BBG obtenidos por el periódico Liberación muestran el pago de $38,571 del gobierno a Müller, desde el 1ro de octubre de 2004, al 31 de marzo de 2010. Anteriormente, durante el juicio de los Cinco, él escribió incendiarios artículos acerca de los Cinco Cubanos y el derribo de los aviones de BTTR. BBG hasta ahora no ha emitido información relativa al empleo por su parte de reporteros de Miami antes de noviembre de 1999. Los últimos minutos de vida de los cuatro pilotos derribados en aguas internacionales por aviones MiGs castristas han quedado filmados y grabados para la posteridad. Lo que nos faltaba por escuchar...a viva voz...sin cortapisas sin pudor alguno...con acento de calculada premeditación sangrienta....los subalternos solicitando al comandante en jefe la orden para pulverizar con un cohete soviético a las avionetas indefensas de Hermanos al Rescate...Se cumplen cinco años del horrendo crimen cometido en aguas internacionales. Por tal razón el hecho debe ser potestad jurídica y humanitaria de todos los organismos de justicia humana, desde el Tribunal Internacional de la Haya hasta la Comisión de Derechos Humanos de las Naciones Unidas. La Confesión del Crimen... en la propia voz del verdugo subalterno... la hemos escuchado al fin con absoluto claridad.... durante el juicio a los espías castristas infiltrados en Miami. Que más falta ahora para tomar la decisión de sentar a Fidel Castro. Qué más falta ahora para tomar la decisión de sentar a Fidel Castro ante un Tribunal Jurídico Internacional? Pues nada más. Todos los elementos indagatorios están a la mano. El hecho es tan detestable por su naturaleza criminal contra la humanidad que sugiere un banquillo para los acusados, ya sean verdugos subalternos o verdugos de jefatura máxima. El sitio Web ReportersForHire.org está poniendo a disposición del público los documentos recientemente revelados mediante FOIA. Debido al fuerte interés en las miles de páginas de material de contratación para los medios de Miami, que el periódico Liberación obtuvo, y que constituyen las bases para este análisis y las series de reportes, estamos poniendo a disposición del público los documentos para su lectura y comentarios en www.ReportersforHire.org. Hemos escaneado los materiales y los hemos convertido en textos que pueden ser localizados con reconocimiento de carácter óptico. Estos materiales contienen información acerca de los contratos de BBG con los medios de Miami, incluyendo, por ejemplo, la revelación de que Enrique Patterson, un prominente periodista de Miami, recibió $135,350 del gobierno de EE.UU. entre noviembre de 2002 y junio de 2007. Le invitamos a comentar acerca de las secciones o los hechos que usted considere interesantes y nosotros podemos usar lo que usted observe o descubra en los documentos, como parte de estos reportes, o como una anotación a los documentos. Por favor, incluya los números de las páginas de los documentos y los pasajes directos en sus comentarios.